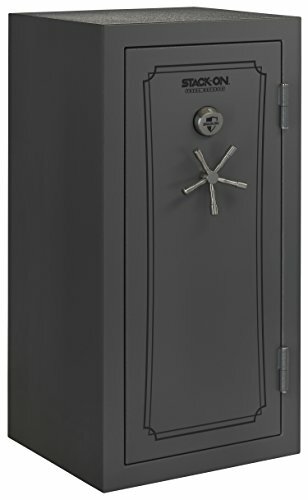 Stack-On’s total defense safes provide protection against fire and water damage as well as securing your valuables and firearms. These safes are fire resistant for 75 minutes up to 1400 degree F and waterproof in up to 2 feet of standing water for up to 72 hours – verified by an independent testing lab. Carpeted barrel rests, plus an additional barrel rest included, provides more flexibility for storing long guns. Barrel rests are fully adjustable, one side can be lowered to hold MSR while another holds longer rifles or shotguns, you adjust the height to meet your needs. Our U-shaped barrel rests have spots for scoped rifle storage. The reinforced steel door is filled with fire retardant material. The door stripping expands when exposed to heat, sealing the door and protecting the safe’s contents from a fire. A synthetic rubber gasket and other sealants provide waterproof protection. We also include a factory installed electrical socket for charging or powering electronic devices inside of the safe. Fastening hardware is included with each safe.